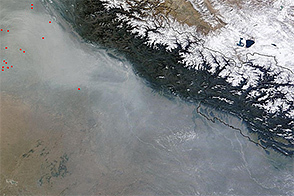 As is often the case in the winter, a thick river of haze hovered over the Indo-Gangetic Plain in January 2013, casting a gray pall over northern India and Bangladesh. 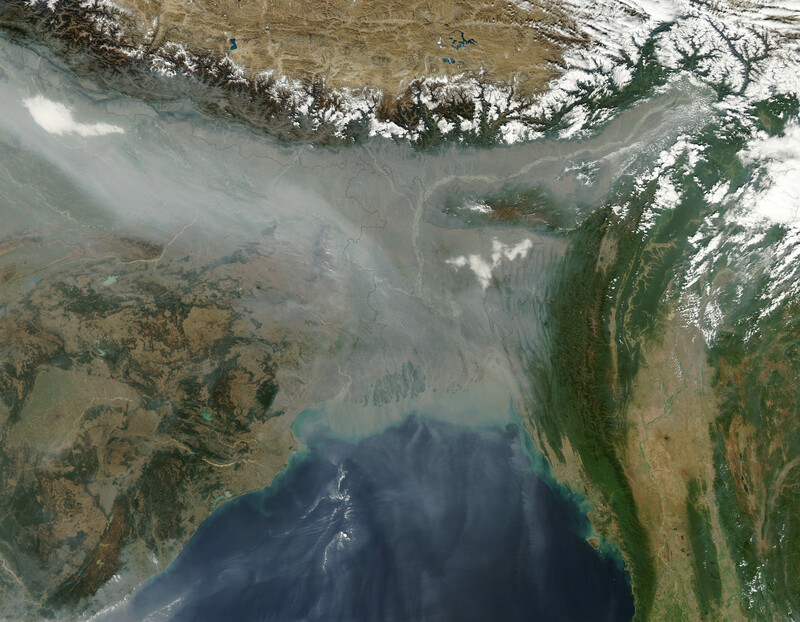 On January 10, the Moderate Resolution Imaging Spectroradiometer (MODIS) on NASA’s Aqua satellite captured this image of haze hugging the Himalayas and spilling out into the Ganges delta and Bengal Sea. 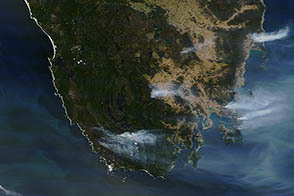 The haze likely resulted from a combination of urban and industrial pollution, agricultural fires, and a regional meteorological phenomenon known as a temperature inversion. Usually the air higher in the atmosphere is cooler than the air near the surface, a situation that allows warm air to rise and disperse pollutants. However, cold air often settles over northern India in the winter, trapping warmer air—and pollution—close to the surface, where it has the greatest impact on human health. Air quality has emerged as a significant problem for India and Bangladesh in the past decade. A study conducted by Tel Aviv University researchers and published in the American Journal of Climate Change found that levels of air pollution in large Indian cities increased at some of the fastest rates in the world between 2002 and 2010—faster even than rapidly-growing Chinese cities. Many Indian cities recorded double-digit increases in pollution over the study period. 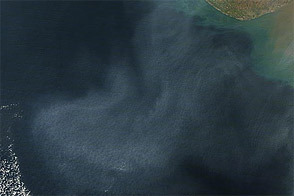 Calcutta, the third-most populous city in India, saw an 11.5 percent increase in pollution; Bangalore (not shown in the image) had the largest increase of any Indian city: 34 percent. 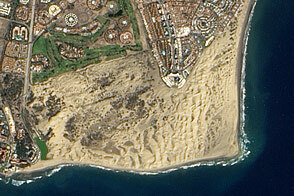 The research was based on information collected by MODIS and by the Multi-angle Imaging SpectroRadiometer (MISR) on NASA’s Terra satellite. 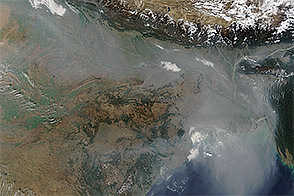 NASA (2010, Sept.15) NASA Data Track Seasonal Pollution Changes Over India. Accessed Jan. 11, 2013. New York Times (2012, Feb. 1) India’s Air the World’s Unhealthiest, Study Says. Accessed Jan. 11, 2013. 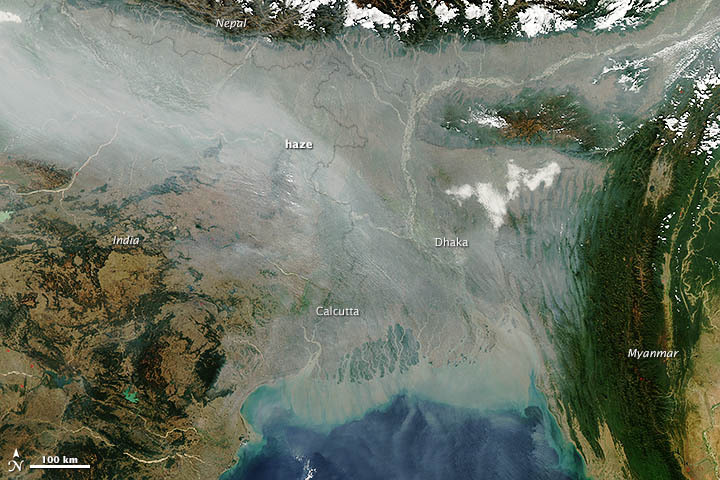 Thick haze hung over northern India and Bangladesh in January 2013. Over the past decade, large cities in India have seen some of the world's fastest-rising levels of air pollution. Pinhas, A. (2012, Nov.) AOD Trends over Megacities Based on Space Monitoring Using MODIS and MISR (PDF). American Journal of Climate Change. Accessed Jan. 11, 2013. Hindustan Times (2012, Nov. 30) India Tops China in Air Pollution Level Increase. Accessed Jan. 11, 2013. Time (2013, Jan. 8) India’s Air Pollution: Is It Worse Than China’s? Accessed Jan. 11, 2013.